SIZE: Fun Central Glow Sticks Necklaces come in all white set of 100, with connectors. These especially exceptional necklaces are bright white and will brighten up your whole day and event! Dimensions: 22 inches long and 6 mm in diameter. ACTIVATE: To activate the item, snap it and then shake it until it starts to glow. Each necklace glows 1 time, for 8-12 hours. PERFECT FOR: The Glow Stick Bulk includes white to fit special for your occasion. Fun Central Glow in the Dark Necklace are a perfect addition to festivals, raves, amusement parks, kids' birthday parties, glow-themed events, party favors, and more!. 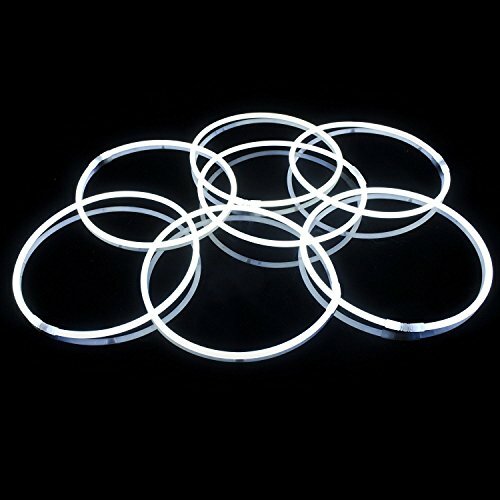 INCLUDES: One box of these Premium Glow Necklaces features 100 pieces of Glowing White Necklaces with 100 plastic connectors. If you have any questions about this product by Fun Central, contact us by completing and submitting the form below. If you are looking for a specif part number, please include it with your message. His Reward Chart - A fun, novelty reward chart for a man: Ideal for dads, husbands, boyfriends, bachelor/bachelorette party gift, stag/hen party gift, fun bride and groom gift, Valentines Day gift.